Seattle from Alaska Flight 495, originally uploaded by The Bacher Family. 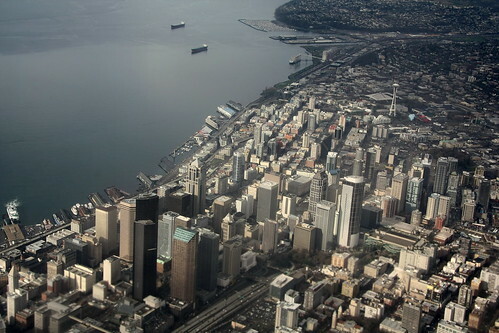 On my way back from a conference in San Diego in February, I snapped this photo out the window of my airplane as we passed over downtown Seattle. It's tough to take pictures through airplane windows! I found I got better results without the UV filter on, but still had to adjust the exposure significantly after the fact to compensate for the thick windows.